Thesis: What effect does pig waste have on microbes involved in the phosphorus cycle in soil? The main focus of this research is to develop novel molecular techniques for characterising microbes involved in phosphorus transformations. These molecular tools will be used to determine the impact of piggery waste by-products on microbial phosphorus cycling as well as to assess the quality of the waste by-products in terms of plant growth promoting soil amendments. My PhD research involves the adaptation of microbiological, microscopic, chemical and molecular techniques for analysing phosphorus cycling in soils. A greater understanding of the factors that regulate microbial phosphorus cycling in soil is fundamental to sustainable agriculture and to future food security. 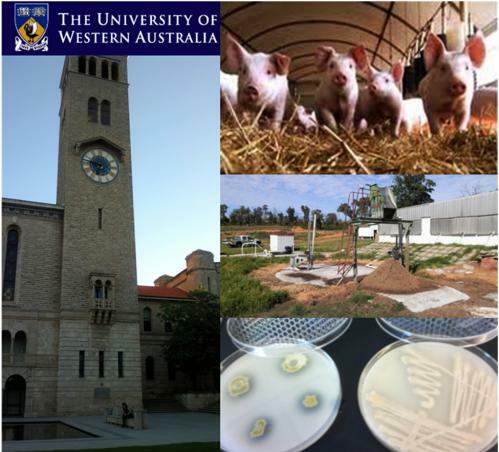 My research investigates the microorganisms that mediate phosphorus transformation pathways in both piggery waste by-products and soil, and includes the development of molecular biomarkers that target phosphorus-utilising microbial groups. Phosphorus turnover in effluent streams will be monitored and the effectiveness of the supply of phosphorus from piggery by-products will be compared with synthetic phosphorus fertiliser. This research will open-up new avenues for sustainable agriculture through cost-effective use of phosphorus resources and the potential development of novel biofertilisers. From an environmental perspective, the recycling of nutrients from piggery waste will reduce waste accumulation and minimise nutrient leaching that leads to eutrophication of water bodies.